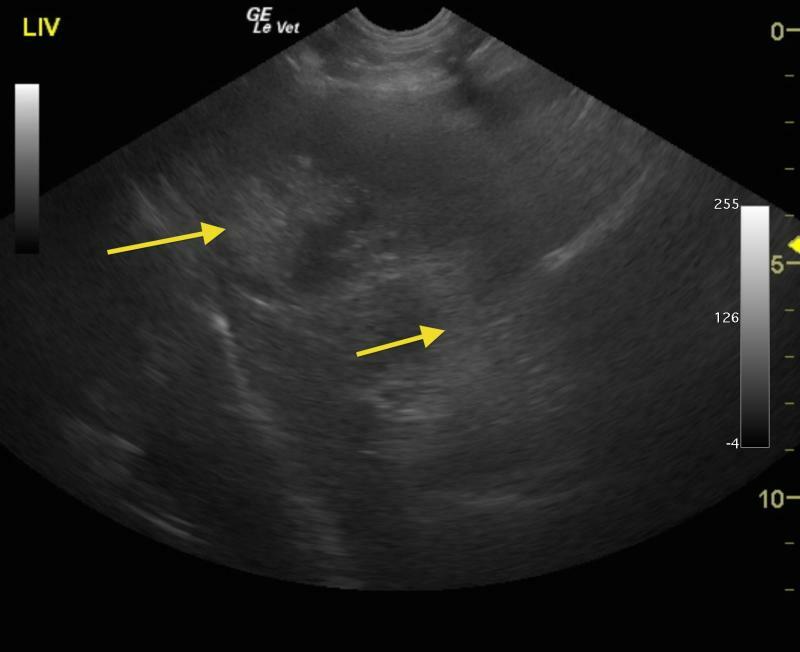 The sonographer immediately recognized the gall bladder (GB) pathology as a potential surgical emergency given the ill-defined fat and + Murphy sign and texted the image for quick review by the remote specialist alerting him to the urgency of the case she was sending to Dr. Lindquist at the Sonopath telemedicine service. Left cranial abdomen reveals ill-defined echos and trace free fluid between the spleen and left liver. Applying manual pressure to the same approach as the prior image the echoes are cleaner with less scatter cleaning up the image and defining the thickened GB wall with visible inflammation (small arrows) and complete repletion of pathological gelatinous bile (large arrow). This view demonstrates the advantage of "flattening out the playing field" with manual pressure with the probe hand and how the artifact is greatly reduced. Postoperative view of the perforated GB mucocele. Courtesy Dr. Phil Zeltzman DACVS. 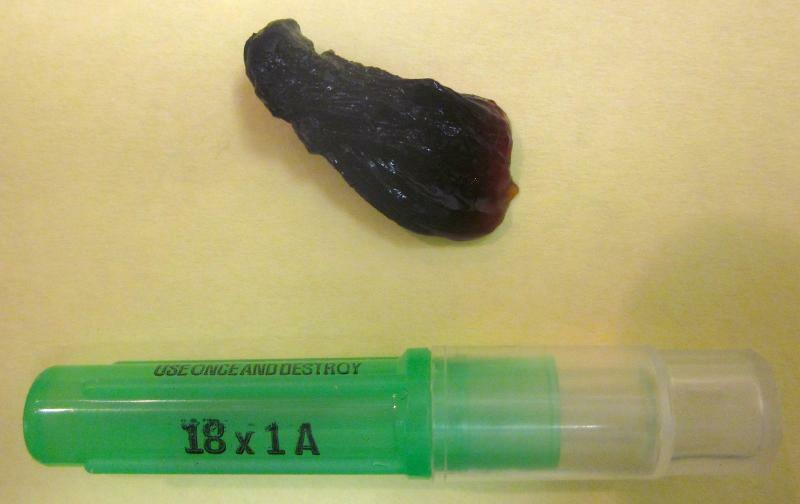 A huge mucus plug that was flushed out of the papilla through a duodenotomy. GB Mucocele: Its Not About The Kiwi! Thanks to the diagnostic efficiency workflows of Rebekah Jakum ARDMS of Pennsylvania Mobile Ultrasound (www.pamobile.net), Phil Zeltzman DVM, DACVS (www.drphilzeltzman.com), & Rossmoyne Animal Emergency (raetc.com) & yours truly (http://sonopath.com/about/specialists/eric-lindquist-dmv) to get this case from sonogram to interpretation to surgical table within a couple of hours so the bile peritonitis bomb that went off in this dog could be addressed immediately. 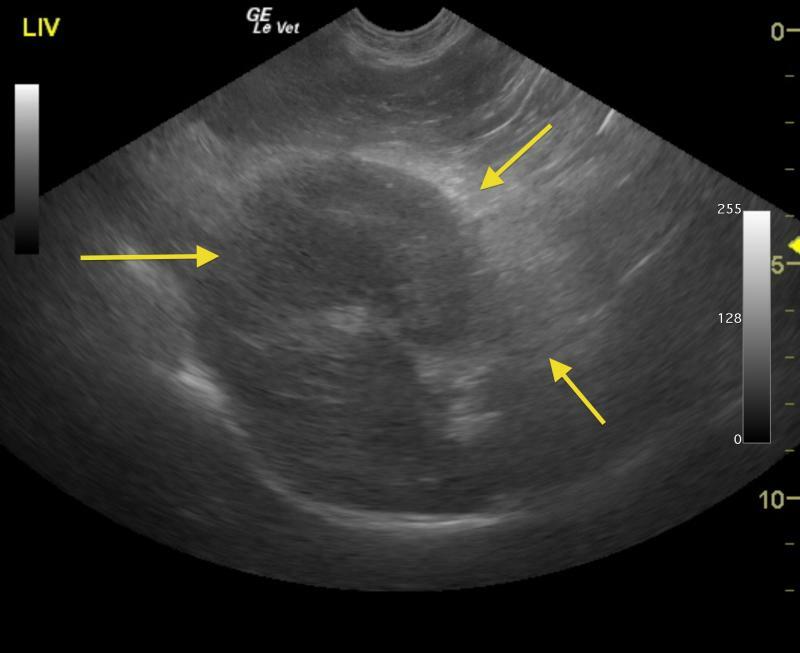 Diagnostic efficiency in a nutshell represented by this month's case of the month: Ruptured GB mucocele in Labrador with bland clinical profile. 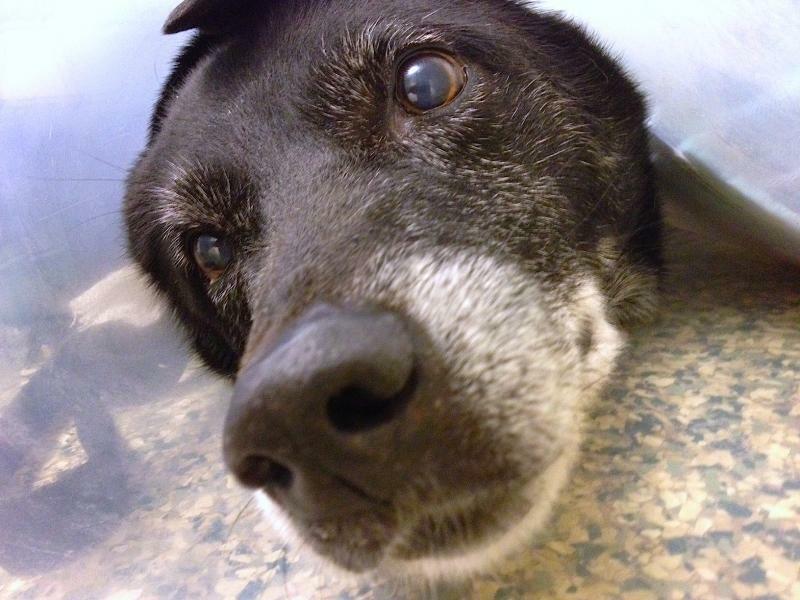 12-year-old MN Labrador mixed breed was presented for evaluation of anorexia, vomiting, and lethargy. Abnormalities on CBC and serum biochemistry were severe leukocytosis,neutrophilia, hemococentration, and elevated ALP (600). Gallbladder - cholecystitis, mucocele, rupture. Liver- neoplasia, abscess. Pancreas- pancreatitis, neoplasia. Abdominal cavity- peritonitis. 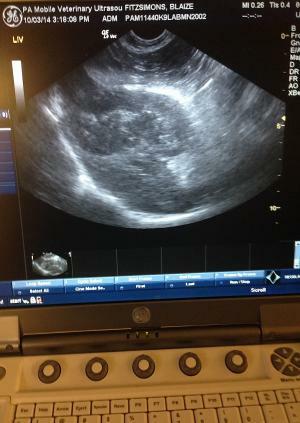 The liver in this patient was swollen and mildly irregular in contour. 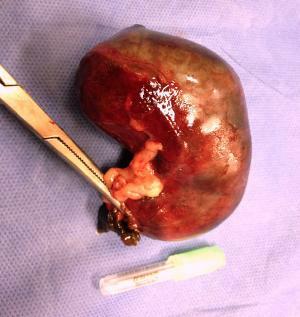 The gallbladder was dilated and egg shaped form with suspended, striating bile, completely inspissated. The wall and neck of the gallbladder was echogenic. Ill defined, inflamed fat was noted in the region. There were minor areas of free fluid was noted as well. Adhesions were noted throughout the region of the portal hilus and enveloped the pyloric outflow. The pancreas presented heterogenous changes in the right limb. The stomach presented some fluid accumulation and mild edema. Inflamed or possibly ruptured gallbladder mucocele with adhesions in the region of the portal hilus. The common bile duct was not visible owing to adhesion pattern. 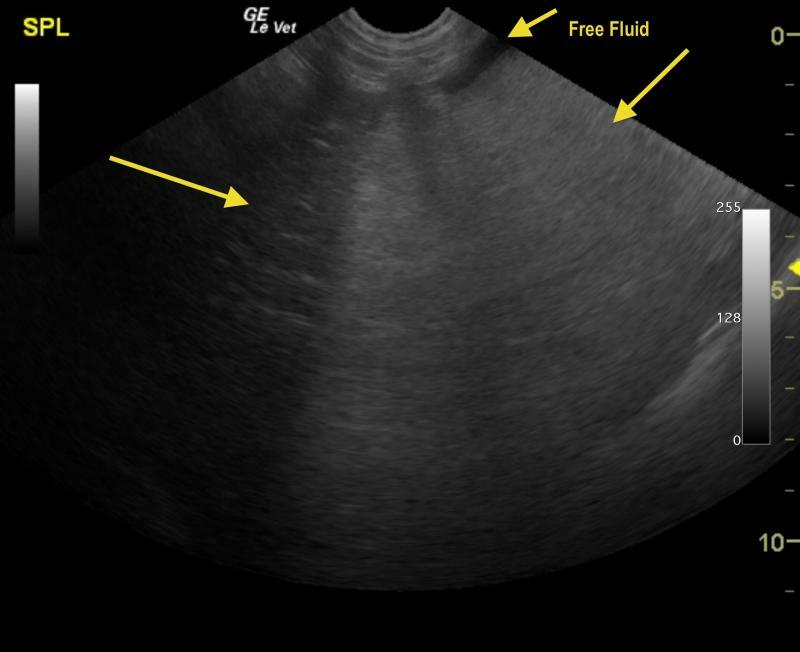 Free fluid which is suggestive for possible perforation or inflammatory fluid deriving from the pancreas and gallbladder. This is a surgical emergency. Surgical intervention confirmed ruptured GB mucocele and localized bile peritonitis. The ill-defined fat tells the sonographer where the primary pathology lies. In this case the adhesion pattern and more pronounced inflammation is attached to the GB with some ill defined echos extending to the pancreas. The + Murphy sign (pain upon imaging) noted by the sonographer was also key to recognizing the urgency of the presentation. The patient was on the surgical table approximately 3 hours after the text message was received notifying the specialist of the urgency. 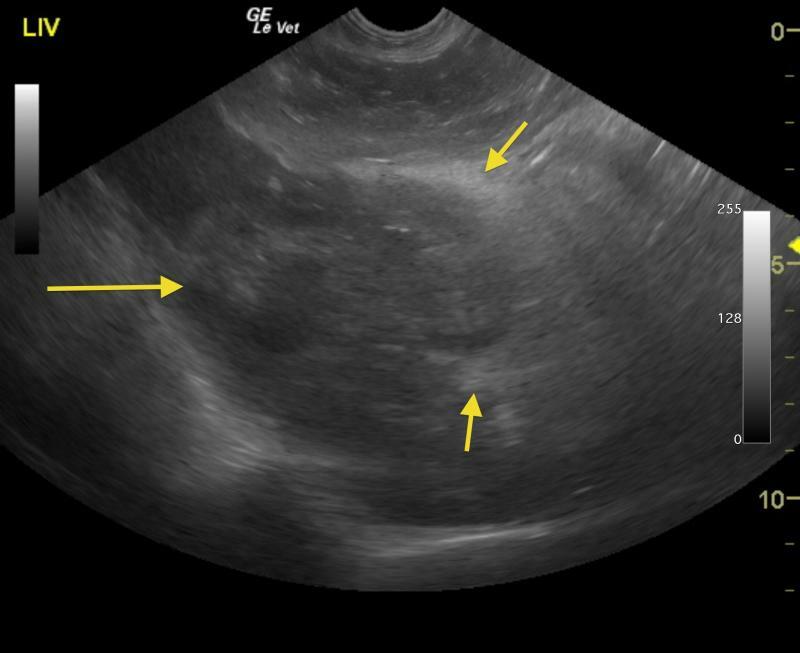 Unfortunately a couple of articles that discuss Gall Bladder (GB) mucoceles talk about a "Kiwi" shape and that image stuck in many minds as an absolute necessity to call a GB a mucocele. But if you live by the U/S probe and check the SonoPath archive of hundreds of mucocele/surgical biliary cases like this one, you really have to have an imaginascope to derive "fruitful" images from the GB presentation with these patients. Especially when a GB leaks or perforates; it acts like a "flat tire" resembling a "smashed kiwi" or a "rotten tomato" perhaps. If you don't forget about the "fruit" & make your move answering the ubiquitous question "What does this? ", you may end up with a dead patient from bile peritonitis. These cases can be difficult to image because the echoes are ill-defined from all the omental inflammation that surrounds the GB, cystic duct, portal hilus, and often the pancreas with the presentation being misdiagnosed often as "pancreatitis" especially when the liver enzymes are not aggressive in the profile like this case. The CBC/Chem panel is often not exciting like this Labrador had on presentation with only a mild SAP and minor leukocytosis elevation with NORMAL Bili and ALT. Essentially the liver spills the enzymes not the GB, as the GB is mostly a fibrous and somehwat secretory structure. So, if the liver parenchyma is not affected and the body is largely "walling off" the infected mucocele with its omental band-aid, there is little to spill into the bloodstream as markers for us to detect on our blood work. That's my island of pathology theory anyway derived from what's in the sonopath archive and years of experience dealing wiht these cases in the field. Take a look for yourself and draw your own conclusions. Its all on line 24/7 for members. Still skeptical? Take a look at our GB mucocele survey from 8 experienced sonographers on how they manage GB mucoceles as well as our surgical biliary study showing only 25% of surgical biliary disease cases have clinical icterus. (http://sonopath.com/resources/research-publications). Interesting findings to remind us to rely on the probe, clinical intuition, perhaps the sonopath archive & forum (http://sonopath.com/signup), and forget about the 'fruit" and go with your gut. In the end that's what the pet owners come to use for; our "gut feeling" to do the right thing for their pet. Adjusting the approach from subxyphoid spreading out the probe pressure manually disperses the artifact and "flattens out the playing field" and minimizing the distance between probe and GB evidencing trace free fluid adjacent to the inflamed GB will ill-defined hyperechoic fat attached to the GB neck. The sweep through the liver parenchyma is uneventfully uniform which follows the pathological island theory and why such a bland live enzyme profile was present at the time without ALT or AST elevation. Note that acute hepatitis can look normal sonographically as well. Subxyphoid sweep through the pylorus noting minor lumional fluid in the stomach and ill defined fat around th epyloric outflow and pancreas. The sonographer could easily mistake this for simple pancreatitis but this is minor compared to the pronounced ill defined fat attached to the GB which indicates that the GB is the primary problem in this case and secondary pancreatitis often can occur given the regional extension of inflammation and caustic bile leakage when perforation occurs.